How the heck did I end up back here? After a decade and a half of saving and investing, I’ve seemingly come full circle. Back then, I understood that the answers weren’t meant to be given all that much thought. Telling an aunt or uncle what you were going to be was simply a form of entertainment, and I treated it as such. So instead of taking it seriously, I’d give evasive, constantly changing answers: Interstate Highway Line-Drawer, professional yo-yo artist, intergalactic keeper of the peace. But you could only avoid reality for so long. Once I started applying to colleges, I could no longer dance around it — most schools wanted to know what my major would be, with the implicit understanding that I would turn this major into most of my identity. Because apparently, people pick a single thing to do for life. Selecting also meant de-selecting, as picking one choice simultaneously excludes others. Physics majors don’t typically wind up on Broadway in their mid 20s. Sculptors aren’t going to engineer the next breakthrough in fiber-optics. So I tried to imagine which subjects I’d find personally rewarding, while also including other vital considerations as a part of the thought process: approval from parents, an opportunity to earn a decent living. 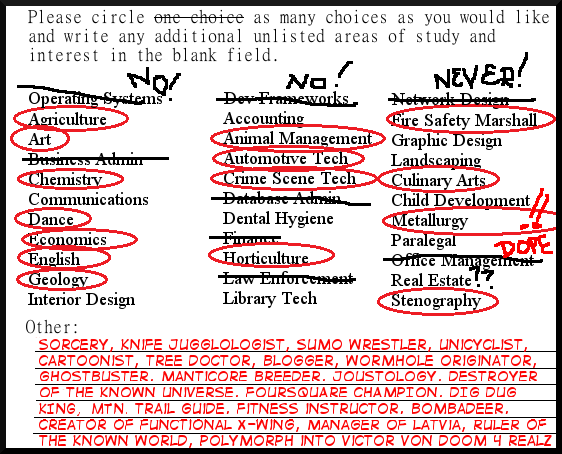 I worked it out while staring at choices on my admissions forms. Communications, Art History, Sociology — nope, nope, nope. Finally I settled on computer science because I liked video games and computers all right, and I read a projection in U.S. News that programming jobs would be in high demand for the foreseeable future. Ah, internet. You’re cynical enough for the both of us. And I knew damned well that I’d need a job. My parents were not well off, not by a long shot. There could be no failure to earn money after graduating — unlike many of my peers, I did not view college as a four year vacation. It was an opportunity to acquire skills to support myself so I wouldn’t, you know, end up homeless or anything. With the decision made, I launched headlong out of high school, past the start gate of university, and into the stuff that makes up adult lives. It went well. Unexpectedly well, really – especially considering I had virtually no idea what would be in store. My university experience in particular was fantastic, full of passionate teachers, motivated and friendly classmates, and interesting work across the board. It’s cliche but true: Learning and exploring are fun in the right environment. Turns out I really liked programming and system building. It requires patience, tenacity, focus, and an ability to solve complicated problems. Still, overall, it was a fine choice. I’m one of a minority, a handful of very, very lucky people who picked something good enough on their college applications to sustain them for nearly twenty years — four years of school and fifteen in the workforce. I don’t honestly think I could have done any better, given my own personality and preferences. Even knowing what I know now, I’d make the same selection again, and would sincerely recommend a similar path to others. And I’ll also be the first to admit that two decades is a long time for something to be consistently engaging, as far interests go. The part of me that codes, integrates, implements, and troubleshoots will always be with me. That being said, I no longer see much direct nerd-on-computer action in my future. It’s become boring. Pretty sure this phase of my life is over, for good. Whassamatter, Flick? You getting tired of gathering food every single year? Well, tough, because that’s what harvester workers do. 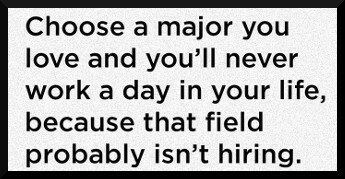 The fundamental problem with picking a major, and, by association, picking life, is the lack of variety. Kids know this perfectly well. They don’t know what they want to be when they grow up. Their answers do change every day. About 80% of college undergraduates change their majors at least once — they have trouble settling on any one thing. Yet the world demands that you pick that one skill. Teacher or engineer, architect or public works official, you’ll have your special area of expertise and you will ply this trade indefinitely (i.e. as long as your industry allows you to) in a continual trade for temporary financial stability. But only a bug, genetically coded to do a small set of tasks forever, could be indefinitely satisfied with this sort of existence. 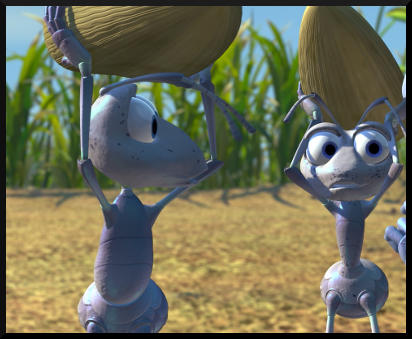 And we are not insects. Just one of many planned future activities. Look, I’ll always be grateful that the world has allowed me to achieve my goal of financial independence. I live a happy, comfortable life by almost any standard. But just like so many others who have been cranking away in the same profession for decades, I’m also routinely tired of doing what I do. 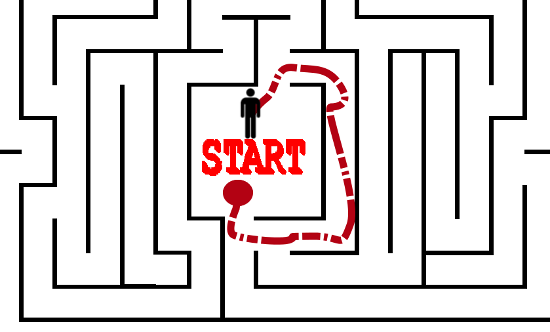 I’m at the starting blocks of that old maze again, selecting new and exciting choices, with absolutely no threat of failure or other concerns about the outcome. And I find that it’s a fantastic place to be. Welcome to the admission form for your new Financially Independent life. This time, you can pick whatever you want without restraint. *** In next weeks’ post I’ll be examining some of my own post-working plans with a bit more detail. Note that I’m putting absolutely zero pressure on myself to actually do any of this stuff. It’s intended to be a simple thought exercise. I’m a lot more like that guy from Office Space: “what would I do if I won the lottery – nothing.” (Although, I admit [two girls at once] is not without appeal.) My time since FIRE has been very leisurely. I’ve tried gardening twice and am hoping third time is the charm this year. And now you have added ‘sorcery’ to the list for me. I might buy a robe for that today. Yep, I get that. 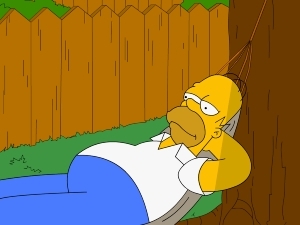 There will be plenty of nothing in my future as well, particularly immediately following ER, as I allow myself to really decompress and get comfortable being idle. BTW, I’ll teach you some tricks when I get up to speed on casting. A person starting out their work life could never imagine these words nestled together in the same Venn Diagram: “stressful, demanding, and tedious.” Usually the “stress” and “demanding” aspects of the job supply a great deal of the excitement. It may be hard to imagine for some but the endorphin rush dissipates. The surge of adrenaline from phony emergencies dries up. Passion in one occupation doesn’t last forever. Those that still get the rush after 20 years are definitely outliers. Of course, it’s impossible to convince anyone starting out that this will eventually happen so they should save as much as possible. It takes a certain kind of person to look into the future like this. Might it even be a person with a particular superpower? Similarly, a person who hasn’t lived the dream for a while (like you apparently have) would not pick up on the strange combination of adjectives in that sentence. I used to get physically pumped, feel sweat breaking out, muscles tense, when working on some so-called critical issue, absolutely driven beyond reason to fix/solve/finish whatever THING was. But as you mention, you realize in time that many of these emergencies are fake, and even if they aren’t, the sheer repetition of similar scenarios soon puts a wet blanket on any fun chemical responses. Take the most exciting movie ever (Avengers?) and watch it 20 times in a single week — by the 6th or 7th viewing, you will be utterly nonplussed throughout. And work isn’t nearly that exciting to begin with. Haha… Great article! Sorcery would be cool! In Grade 3 or 4 they gave us one of those career aptitude tests. (Difficult to believe they were trying to pigeonhole us drones that early?) Beside “What do you want to be when you grow up?,” I wrote: “Timelord.” Tom Baker was my damn hero–even ahead of Batman. Well, that got me a half-hour meeting in a school psychiatrist’s office to see if I knew the difference between reality and imagination and time travel. I proved I did, and also proved that they shouldn’t have written “want to be”, but rather “think you’re going to be” and maybe add “be realistic” in parenthesis beside it. Awesome story, so cool! Tom Baker is the best Dr. Who of all, er… time. When he was the active TimeLord, I was really young — 4-5 — but one of my earliest television-watching memories is seeing the time travel sequences on PBS with my mom. For some reason I found them scary — they gave me nightmares. But even then I knew that there was something special there. Fun fact: Victor Von Doom has a time machine, too. I wanna be a farmer! You should help me – everything I’ve ever tried to grow outdoors has died. I have black thumbs, apparently, but would love to change that. I have killed tons of plants in the past. As a book I read said, a green thumb is just someone who pays attention. The morning walk through the garden is my favorite time of day. I see what might need water, what needs weeding, what can be picked,etc. I’d be happy to help, as I’m trying to become somewhat of a community garden advisor. Email me. Your climate is close enough to mine I can probably recommend specific varieties. And once the snow melts there, you could even snap pictures of the yard and I can help you design a bit. Use the email I comment with. Pjayadeep – yes and no. The best farming techniques do work with bio-mimicry in mind, but most existing plots of land need healthy disturbance to be as fertile as they can, and need human involvement to enhance the biodiversity. I’m familiar with the premise of Fukuoka’s book but I haven’t read it yet. If you want a very good counterpoint to the “nature will do it for you”, read for example Ben Falk’s “Resilient Farm and Homestead”. His place is absolutely wonderful, a rich ecosystem, but only because of human involvement (what’s call anthropogeny in permaculture terms). Left to “nature” it will revert to a relatively infertile forest with barely any biodiversity at all. Cool – I forgot that you are moving as part of the transition. Already have a place picked out? We have an area but not a specific place. The snow in the NE has made it difficult to seriously tackle this until now. I love this. I think it gets to the root of my discontent at work. I have so many ideas, so many things I want to be doing, but being a father, a husband, and a good little employee occupies essentially 100% of my time. I find that the emotional rewards of marriage and fatherhood exceed the challenges – not so with employment. I want to build a house, plant a garden, learn to play the piano, speak Portuguese more fluently, travel the world. But the best 9 hours of every day are spent in a gray cubicle. Sigh. What’s 8 more years? Looking forward to what you decide as your next adventure(s). The decision process changes when you can now take “need to make money” out of the equation. It doesn’t mean that you won’t make money, but it doesn’t have the same influence on your decision process. People laugh when I say I want to retire and mow lawns. But that’s the job I miss the most now that I’m in the corporate world. Being financial independent will allow me to mow one lawn a week in the summer (mine) or 30 lawns a week if I want. And the best part is the option to do either! April is so close! Yard work is fun! Mowing is okay with a gas mower. I think I will like it better once I have a rotary mower so that it’s easy to still hear music, or nature, or the kids playing around me. I hate the sound bubble the loud engine puts you in. My landscaping job is the only job I remotely enjoyed, because it was outdoors AND there was no downtime at work. You either had work or you went home. >>And the best part is the option to do either! Yup. In the end this journey is about freedom and choices for most folks. “Although initially exciting [and well-paying throughout] my [lawyer] job became, over the years, increasingly stressful, demanding, and tedious.” I think the tedium is the worst of it. Even in the midst of a manufactured emergency (usually a deadline instituted by a judge), I am completely and utterly bored. I hope writing is part of your next phase. I am hooked on your words. 🙂 Thanks. I’m thinking about it. I’m pretty sure I’ll be blogging most of 2015 at least. Congrats on reaching FI! I never understood the whole “pick a career” that you’re forced into with college. And judging by the numbers 80% of the college students don’t understand it either. While some people are truly born to do a certain thing and know it from the beginning, I think for the most part no one knows. And expecting high school seniors to know is ridiculous. The majority of their work experience is probably a grocery store or restaurant. I’m about 8 years removed from college and I already wonder what else is out there. I’d love to earn enough from my writing to make a living but that’s ridiculously hard so until the income starts becoming semi-regular that’s a no go pursuit right now. But there’s also teaching which I think would be interesting and also some kind of financial adviser to people. Who knows? Thanks for the comment, JC. My understanding is that practically every year that goes by, it gets somewhat more difficult to make a real living writing. Because: Internet, and writers giving away their work for free. It’s not without hope though: the people who make it work at it for a long time and carve niches for themselves. If you enjoy it, keep at it, and the odds that good things will happen increase. Re: Teaching, I also consider that from time to time. I can’t stand doing comp/sci for business anymore, but after decompressing for a while, it could happen.